Lori Gottlieb is a psychotherapist and New York Times bestselling author who writes the weekly “Dear Therapist” advice column for The Atlantic. She has written hundreds of articles related to psychology and culture, many of which have become viral sensations all over the world. A contributing editor for the Atlantic, she also writes for The New York Times Magazine, and appears as a frequent expert on relationships, parenting, and hot-button mental health topics in media such as The Today Show, Good Morning America, CBS This Morning, Dr. Phil, CNN, and NPR. 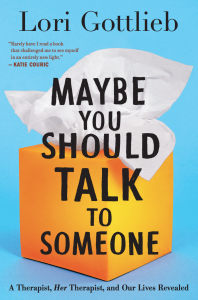 Her latest book, Maybe You Should Talk to Someone, and this week’s conversation is a revealing look at the inner thoughts, struggles and revelations of a therapist who finds herself on the “needing help” side of the conversation, and all the unexpected things this shift in dynamics brings up.